Epic has announced that they are launching a competitor to Valve’s Steam platform, the Epic Games Store. The new store will offer developers 88% percent of sales compared to Steam’s 70/30 split. Initially Epic say they will launch the Epic Games Store for PC and Mac, but hope to expand to new platforms soon, likewise, the initial offering of games will be expanded on over them, and as new platforms become available to them. Epic have also announced that games which use the Unreal Engine will receive special treatment. The Epic Games Store will waive any royalties due to Epic on games sing the Unreal Engine, a real boon to any developer building games using it. The Epic Games Store is also going to have a section dedicated to supporting creators. This section will reportedly allow users to support content creators on Twitch and YouTube for playing a develop’s Games. Tim Sweeney of Epic Games says that while working with Fortnite they discovered a lot about running an online store. In their opinion a storefront charging developers 30% is marking up costs by 300-400%. 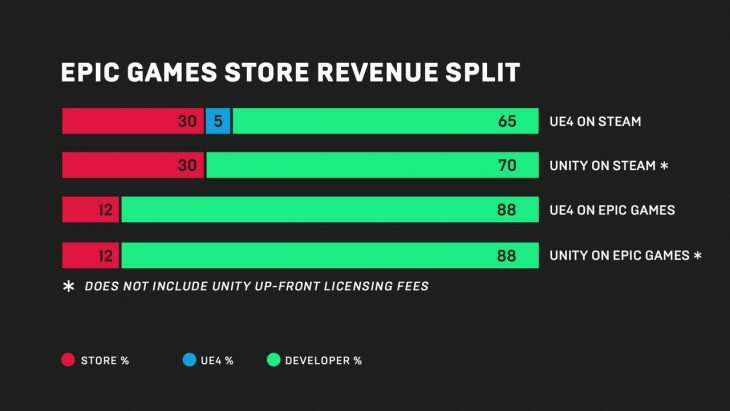 But by offering developers 88% revenue Epic say that their storefront can be a profitable business. The Epic Games Store will connect developers like never before with creators and consumers according to Epic. By linking developers with content creators they feel that marketing a release will be that much easier and more accessible. They’re also big believers in connecting with the community, allowing developers to contact the people playing their games, and vice versa. Throughout 2019, in order to make the store more appealing for the first year, Epic is funding one free game every two weeks for the year. This is great news for consumers since they get to play games at no cost, and developers don’t have to lose out on sales because of it. Currently Epic is hand selecting the games they will offer on the Epic Games Store platform, but in the future an approval process will open it up for more games as more developers seek to get their game selling on the store. 2019 will be the true test for Epic, but given the successful monetisation and popularity of Fortnite, it seems like the company can only prosper moving forward.